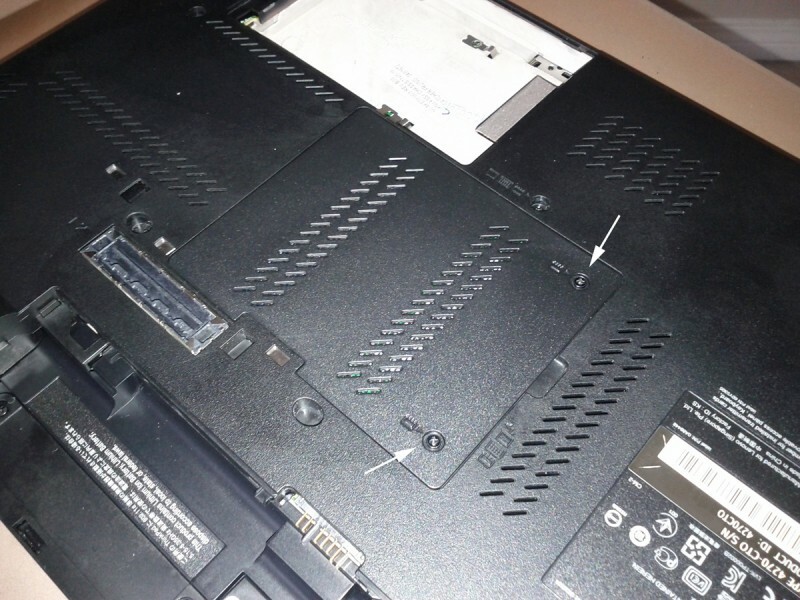 Pretty self explanatory, there are two Phillips screws that need to be taken out of the center panel on the bottom of the laptop. 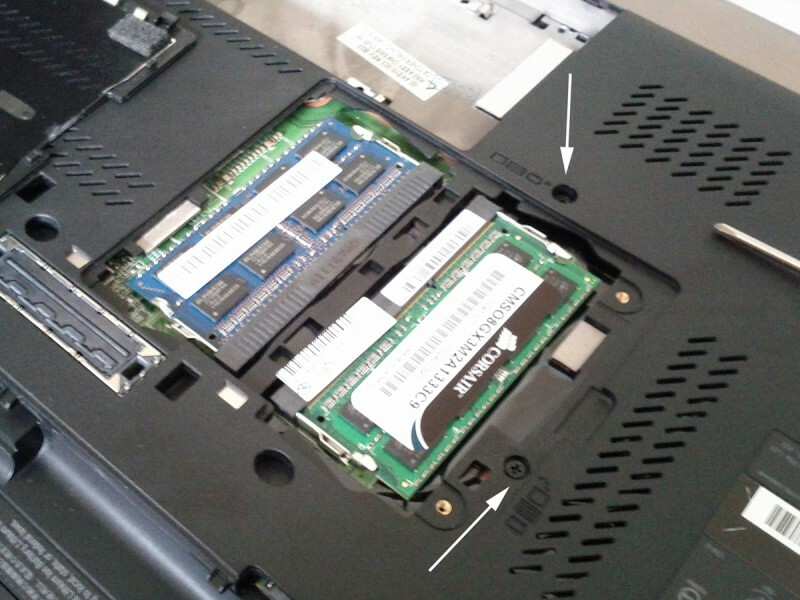 I moved the existing 2 GB SODIMM to the second slot on the bottom and inserted the new one in its place. To get at the mSATA slot the keyboard needs to come out which involves two more screws. This one was a little trickier. Basically the entire keyboard needs to slide backwards until the front of it can lift up and out of the laptop. I used the memory kit packaging in the slot in front of the space bar but others have reported credit cards work as well. I probably wouldn't use something like a screw driver as the pressure would be concentrated on to small of a surface. Easiest step for last. There spot where the SSD goes is covered by a black plastic case. Pull it out, reroute the Cell and GPS antennas, and then undo the single screw needed to hold the drive down. It slides in similar to a SODIMM and then needs to be screwed down. At this point you also want to put in the other new memory module. The existing one needs to be removed to get at the secondary slot as it is underneath the primary one. Step 5 - Put it all back together! Now reverse the procedure and put it all back together. I hope to post information on the actual Windows 7 install and the configuration within the next week or so. How to install the system on this disk? Also think about installing the Intel SSD in my Lenovo. 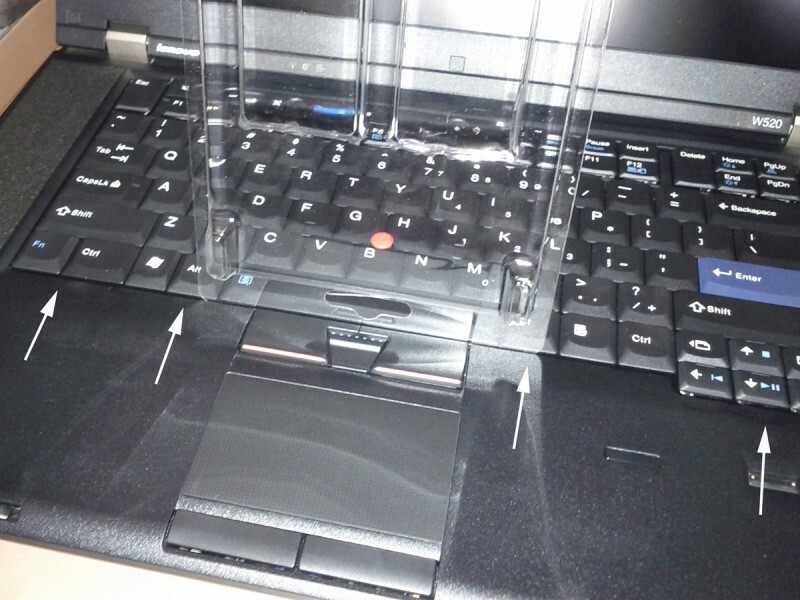 As you plan to install Windows and utilities Lenovo on this drive? As far as I understand there is no possibility to transfer an existing system to another device?! Windows is installed on this drive. I'm planning on doing an article on that process within the next week or two. You are correct in that there is no easy and reliable way to transfer an existing Windows install onto this SSD. Hello my question was, what is the boot time of your device. I'm thinking about installing a SSD intel 310 in my w520. I just did a complete shut down and then started the computer by swiping my fingerprint and it took 32 seconds from swiping my fingerprint to loading Chrome to type this. 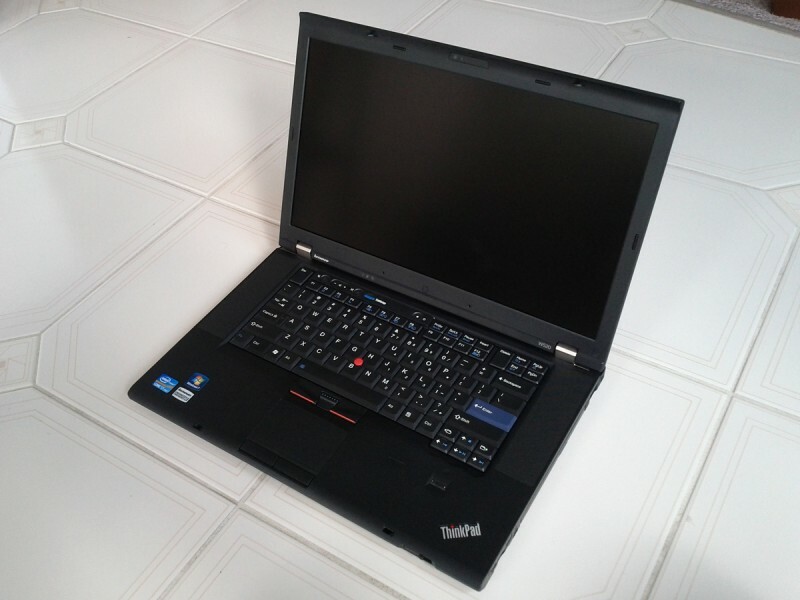 I too have a W520, but in comparison with my previous T510, I'm not so sure I got more bang for my buck. That said, I'm sure it's all the crap on the drive. When I recieved it I did not have time to properly install and configure it, and used the base install. I'm very much interested in knowing how the MSATA experience is working out for you. Thinking I will reconfigure and use the MSata drive in mine as well. I've looked for the post on the install, but did not find it. Did you ever do it? Thanks for the info? 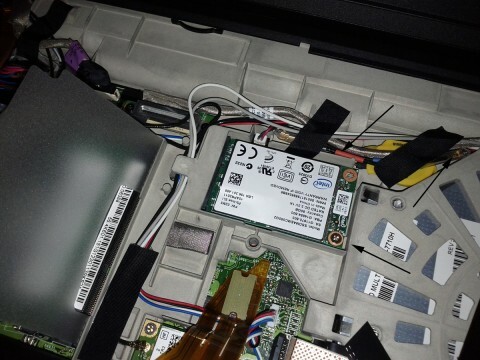 About the mSATA install: I did quite a bit of research into installing Windows 7 onto the mSATA but putting the Users directory on the conventional hard drive. The process was quite tedious as it involved interrupting the Windows installer and running some scripts at a setup command prompt... I would not recommend it for the faint of heart. Furthermore, I had a BSOD while on vacation and rebooted to find Windows complaining about a missing drive. After 12 hours of messing around I concluded that having the OS on one drive and the Users directory on another drive probably caused the problem. I re-installed Windows onto the mSATA drive and this time did a conventional install. Everything is on the mSATA with the exception of Steam, and folders for videos, pictures, and music. I have had no problems with storage since then and would definitely recommend this setup. The computer also feels much faster than when I had the Users directory on the conventional hard drive. I was planning to upgrade to a 2.5" 320 GB drive at some point but if I do get a new SSD it would probably be another mSATA so that I can keep the 500 GB rotating drive. Performance is excellent with the mSATA and I have yet to come across a faster laptop. I would definitely do the reinstall onto the mSATA. Thank you very much for this helpful and informative article. It must be a relief for those who do not know how to install a solid state drive themselves inside their laptop. This is very informative article which you have posted in this blog. I have shared your article to one my friend who is http://www.aussiewritingreviews.com blog writer and do creative writings for the blogs. As, he is having problem with his Lenovo laptop. I thought this article may help him.